Now we go see everything, and honestly he has the most discriminating, thoughtful, excellent taste in movies. I am such a movie buff that it is ridiculous, so I take him to black & white indie films that would be a stretch for most people and he is delighted. Just laughs, cries, and thoroughly enjoys himself. Thank God! My husband LOVED The Trip To Italy. 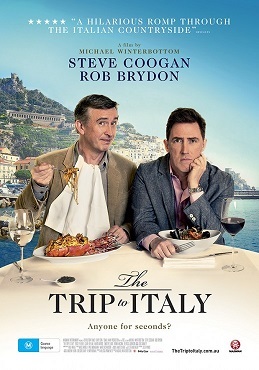 Granted it is a charming movie, with great scenery, and discussions of great food. But the two stars verge on the annoying, and then…just when you wish you could reach up and SMACK them silly, they do a “bit” that makes you laugh right from your belly. They have captured that elusive thing: a long, close, complicated friendship. And the delights and frustrations of traveling with someone. It just feels frank and true and at times unedited…hence the occasionally annoying part. Close friends are annoying at times! All their little foibles and adventures, (and moral failings) on this trip become completely absorbing. When the lights came up at the end, I realized I had been totally drawn in, and that I forgot I was in that stuffy little theater. I felt like I had taken a trip to Italy. Yey! Very good – maybe a trip to the cinema for us!! Ha! I had no idea SLH was such a softie;) As for the flick, the pairing of Steve Coogan (dynamically funny if he gets to venture and not play a typical Hollywood role) and Rob Brydon (extreme brit-humour – I am surprised you liked it;) could be a belly laughing ride or a car crash I would walk outta….. Will check it out! You are such a great writer Leslie!!! I love your description of Steve and movies!! !